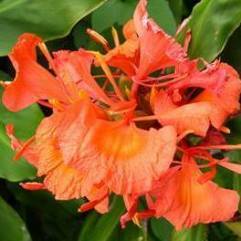 Hedychium is a genus of perennial plants native to tropical Asia and the Himalayas, commonly growing to between 120 and 180 cm tall. 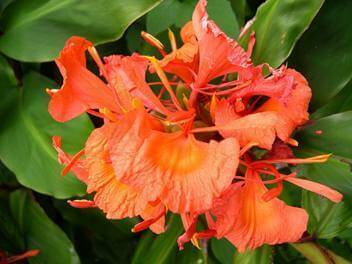 Common names include garland flower, ginger lily, and kahili ginger. Some species are grown as ornamental plants. 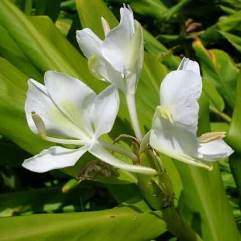 The Hedychium coronarium (white ginger) is the National Flower of Cuba where it is known as Flor de Mariposa (lit. Butterfly flower) due to its similarity to a flying white butterfly. This species is fragrant and women garnished themselves with these flowers during Spanish colonization of Cuba. The intricate structure of the inflorescence allowed women to hide and carry secret messages important to the independence cause inside it.